Dennis and Barbara Rainey, founders of FamilyLife®, help couples establish the important daily habit of praying together, offering personal stories and answering questions about the dynamics of prayer. 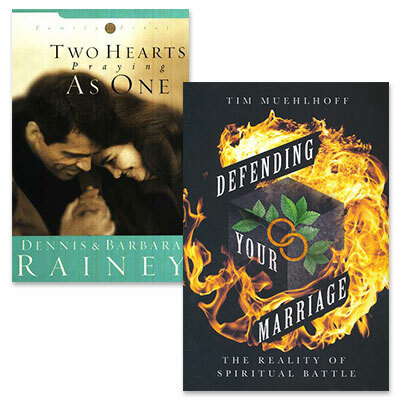 Daily entries—including a short devotion, questions for reflection, and a prayer—take husband and wife through topics related to prayer, spiritual growth, and key marital issues. In the pressure of daily living, preserving a private moment to pray with and for your life—partner can be tough. Yet joining hearts before God is the single most transforming, intimate experience in marriage—a simple act that will fill your life, your relationship, and your home with wondrous love. Dennis and Barbara Rainey tell how a decision to pray together daily strengthened their understanding of one another, reduced conflict, and knit their hearts together in a deep, spiritual bond. Their thirty days of reflections can do the same for your relationship—starting today!